Home/Boys’ Hard Work for Disc Golf Tournament Pays Off! On November 24th Nathan Skinner, a member of Revolution Church and an avid disc golfer, contacted Nick Richardson, our boy’s home houseparent, and brought up the idea of having a charity disc golf tournament to help raise money for the purchase of permanent disc golf baskets to be installed on the Joy House campus. At first, a tournament on the Joy House campus seemed impossible…there was no course in place and no budget to help get one installed. Sure, there was a vision and plan to one day have a course on campus, but a tournament? Nevertheless, Nathan helped the boy’s home formulate a goal. The tournament date of March 23rd was set; they had 118 days to accomplish the design and installation of a full 18-hole disc golf course. The boys went to work. From late November to March 23rd the boys took on a task that was too big to accomplish on their own. The course spans the entire Joy House campus. There was a lot that needed to be done. There were trees that needed to be removed, brush that had to be cut down, fences that had to be pulled up, tee pads that needed to be leveled, dirt that needed to be moved, bridges that needed to be built, sign posts that needed to be installed, acres of briars that needed to be cut back, ditches that needed to be dug, signs that needed printing, a tournament website that needed updating, temporary baskets that needed to be installed, tournament merchandise that needed to be designed and ordered…the boys saw the vision and embraced the project. Our last tee pad that needed to be installed was done on March 22nd, the day before the tournament was to be held. The boys worked hard, and their work paid off in the end. Registration for The Joy House Open filled up weeks prior to the event. There was a buzz in the disc golf community about a new course being installed by teenagers and many players grew in their excitement about the possibility of playing it. 79 players showed up from all over on March 23rd for the big reveal. Philippe Anderson, a pastor and disc golfer from Nova Scotia Canada, read about the tournament online and came out to support us while he was in Georgia. There was little doubt that these boys had pulled of something special. Back in November the idea was to have a small charity tournament with the goal of bringing in around $1,400 for new baskets. Over time the tournament details got bigger and bigger. Home Depot has even stepped in to help fund course improvements and plans to bring a “Team Depot” group out to help course beautification in May. Floyd Road Baptist Church in Austell and Trinity Church in Marble Hill joined together for a work day in February that helped the boys tremendously. The girl’s home painted each tee sign. A special thanks to Bill Sherry at the girl’s home is needed. He helped all along in this project and was there for us in every way. Nick Richardson’s father donated many of the tools used to help clear the brush and trees. There were many donations made for the raffle that took place on the day of the tournament. There was even a porta-john donated by Blu Site Solutions for the day of the event. We are so grateful for everyone that made this day possible. 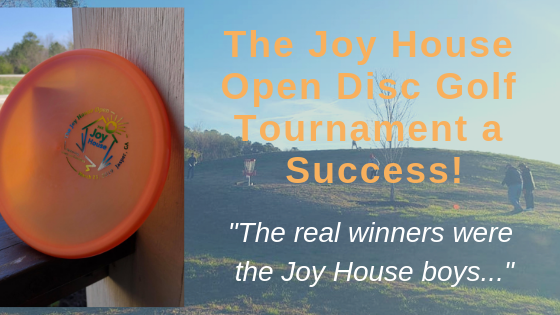 The first inaugural disc golf tournament at the Joy House was a huge success. The Joy House Open fundraised right at $3,600. Matt Dollar, a professional disc golfer sponsored by MVP Disc Sports, won first place in the Pro division with a score of -18 under par over a combined two-round total. The real winners were the Joy House boys who were able to see the fruits of their labor on March 23rd. There was a tremendous amount of joy on their faces as they saw disc golfers they had followed on YouTube come out to play the course they installed. It was a very happy day. Soon we will purchase 18 permanent disc golf baskets and install them to complete the permanent course. Be on the lookout for further information about events and times where you may be able to come play the course. Click here to view our Online Photo Album of the Tournament. The Joy House provides Christ-centered restorative care for struggling teens, families, and individuals. They accomplish this mission through a comprehensive teen residential program and a community Christian counseling center. The teen residential program includes: home life for the teen with a mature Christian couple, an accredited academic program, Christ-centered counseling, and our work with the family. Through our community counseling center we’re addressing parenting, depression, adolescent struggles, anxiety, grief, marital strife, and other difficult life issues serving clients of all ages. For more information please visit our website and follow us on Facebook.